Just a few days ago I was looking at the classic J-Timberlake meme ... 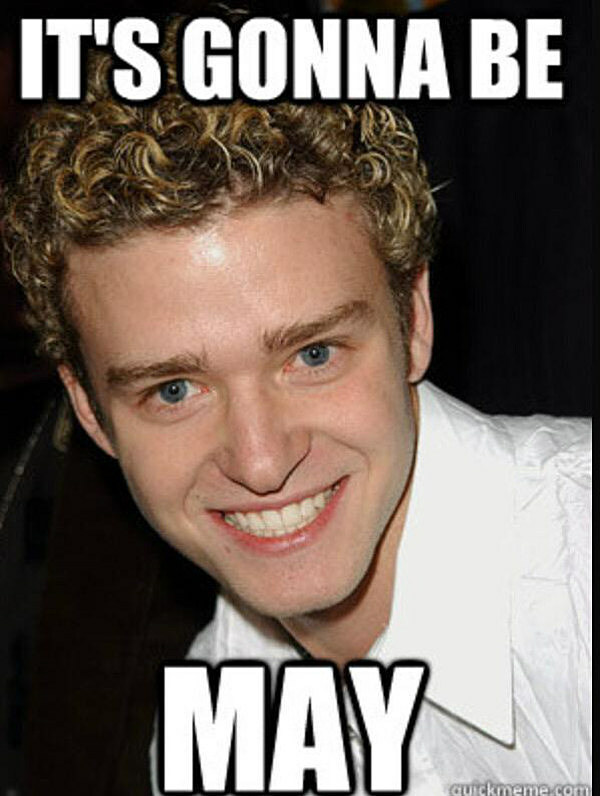 IT'S GONNA BE MAY! and guess what? It's now May! Seriously, how did that happen? Time is flying and I'm not sure I'm fully caught up! If you're a resident of YYC, You know we've had some ups and downs when it comes to weather and I'm happy to report that May is looking pretty good so far. I'm really hoping the snow is gone for good, I mean it's basically summer now right? I decided to bust out some sandals the other day because it was just so beautiful outside. I've been pretty basic in terms of my clothing choices as of recently and to be honest, I feel my best when I'm dressed down. Nothing beats your favourite pair of jeans and a great shirt. I admittedly have this in 3 colours and I have absolutely no regrets my friends! What's your go to outfit?